We tried two different powder pack “drop-ins”, the blue Walex Porta-Pak Deodorizer and the orange Camco TST Citrus Scent. The blue Porta-Pak was able to keep down the smell but was difficult to use in our grey tank because of the powder pack design. It took forever to dissolve in the sink. The orange Camco did not eliminate the smell, it actually made it worse. The chemical citrus-poo mixture was absolutely horrible and reminiscent of a porta potty. Definitely not what we were looking for and we tossed these before finishing them. Unfortunately, neither of these met all of our requirements. Pass. Our RV came with a small bottle of Thetford Aqua-Kem liquid treatment. Being a liquid it checked the easy to use box, just pour it in. We were also able to use it in our grey tank, another point in its favor. However it missed the bar on the final and argumentatively, the most important part. It didn't make a noticeable difference in eliminating the smell of the black tank for the 4 weeks we used it. Pass. 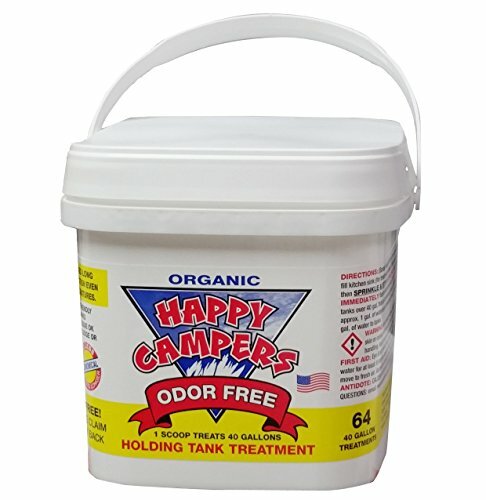 We found Happy Campers black tank treatment when looking around RV forums. Since it was recommended so many times, we decided to check it out. We are glad we did! Happy Campers did an amazing job eliminating any smell from our black tank. It does not attempt to mask it with a horrible citrus smell but completely eliminates any smell. We are also able to use it in our grey tank, score another point for Happy Campers. While arguably the “hardest” to use, I enjoy the fact that it is powder. The act of mixing the powder with the water before releasing it down the tank gives me the extra surety that the pod isn't sitting in my tank and not breaking apart. I’ve only used water in the black tank. just dump once a week or when it’s 2/3 or better and rinse well. We agree Glen, even with Happy Campers we use a lot of water. We started looking for more when water alone didn’t cut it when we were in the heat with no sewer hookups.